LONDON (Reuters) - An elaborate London hall, dubbed by some as the "Sistine Chapel of the UK" because of its baroque interior and ceiling, is re-opening its doors after a two-year conservation project. 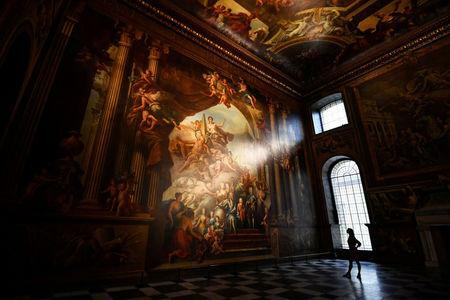 The Painted Hall of the 17th century Old Royal Naval College in Greenwich is decorated with the work of British artist James Thornhill, which he began in 1707 and finished in 1726. Conservation director Will Palin said the work - depicting English naval prowess, monarchs as well as mythological figures - had been cleaned and had lost paint flakes restored during the 8.5 million pound ($11 million) project. "It was very nerve-racking when the scaffolding first came down because there was this moment of would it look any different from when we started," he told Reuters on Wednesday. "But that moment with the ceiling being lit and the colors coming through and the vibrancy, the richness of the painting revealed, it was very moving I felt quite ... emotional." Old Royal Naval College Chief Executive Angela McConville said the comparison to the Vatican's Sistine Chapel, where throngs of people queue to see Michelangelo's frescoes, was made "because (the hall) is the most significant painted interior in the UK". "It is 40,000 square feet of baroque decorative painting ... an extraordinary achievement ... of international significance," McConvill said. "What Thornhill has created is a cast of characters. He is wanting to illustrate a range of things that are happening in Britain at that time. It is an epic statement of the cultural, naval, and maritime achievements of the nation." The Painted Hall in the naval college designed by Sir Christopher Wren reopens to the public on Saturday.